The WCARC members celebrated Field Day in 2002 at their normal location, the Woodford County Park football stadium. But this year the Woodford County Emergency Management office suggested they use the new Emergency Command Post. 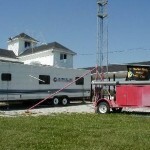 The new trailer provided air conditioning, a generator, and space to set up 3 radio stations. With the WCARC portable 55 foot tower parked next door this provided an ideal field day environment. 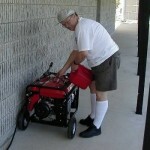 Paul, KB4ENQ, refuels the generator. 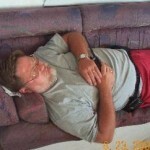 Mike,KG4IES, rests his eyes after a long operating session. 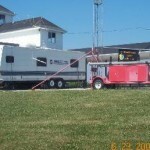 The Emergency Command Post and the WCARC portable tower provide for a comfortable and efficient field day. 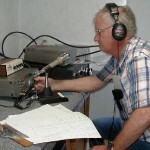 Stuart, KG4TNA, works 40 meters. 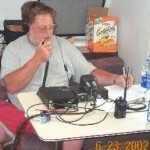 Mike,KG4IES, operates on 6 meters.